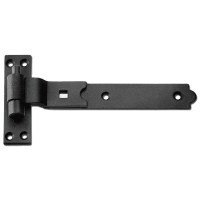 Our choice of Ironmongery hinges, for external gates and doors, come in either a black or Zinc finish. All of our ironmongery hinges supplied by Locktrader come in pairs. Each type of hinge comes supplied in a range of sizes, for example, our Hook and Band Hinges (Straight and Cranked) are available in the following sizes: 300mm (Available in Cranked only) 350mm, 400mm, 450mm and 600mm. The difference between the two styles being that Cranked hinges keep the door flush with the post when in the closed position, whilst straight hook and band hinges allow the gate or door to be proud of the post. These are our heavy duty hinges. We have medium duty Asec Tee Hinges, these hinges come in two finish types, Black and Zinc, so that they can suit any existing doors or furniture that they are applied to. 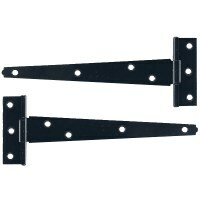 Both the Black and Zinc finished hinges are available in the following sizes: 350mm and 400mm. Finally we have our light duty Asec Tee Hinges, which are ideally suited to lightweight gates, doors and cupboards. These hinges also come in Black and Zinc finishes, with the following sizes available for each finish: 150mm, 200mm, 250mm and 300mm. We have a variety of external hinges available to you, with specification details on each of our product pages, you can be sure to find the type of hinge on Locktrader.